A few thousand – or even a few hundred – votes separate the top finishers in three of Arizona’s nine congressional races, with more than 300,000 ballots yet to be reviewed and processed. Democrat Ann Kirkpatrick barely won the race to represent Arizona’s 1st Congressional District, with final counts putting her just above her opponent, Republican Jonathan Paton, who had led in the returns most of election night. 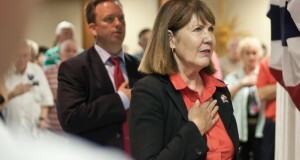 Republican congressional candidate Jonathan Paton pointed to his military service and years served in the Legislature and his Democratic opponent Ann Kirkpatrick painted herself as a bi-partisan bridge builder. But eventually their Thursday night debate in Casa Grande for Arizona’s 1st Congressional District turned to the negative images each has been proffering about the other. The Democratic Congressional Campaign Committee stepped up the attack on Republican Jonathan Paton this week and has so far committed half a million dollars in TV advertising to help former U.S. Rep. Ann Kirkpatrick in her bid to win the seat. The primary race to represent the largest swath of Arizona in Congress largely is being fought like it's the general election, with the Democratic and Republican front-runners banking on their name recognition and past legislative experience to secure the 1st District seat. The field of candidates in Arizona's 1st Congressional District race is narrowing. The race to fill the open congressional seat in Arizona’s sprawling 1st Congressional District has become an expensive one, with nearly all of the money coming from elsewhere. In the race to represent Arizona’s 1st Congressional District, former Democratic Rep. Ann Kirkpatrick and Republican Jonathan Paton boasted their best, and somewhat comparable, fundraising quarters.